The radiation-induced heterogeneous processes of water decomposition on mixtures of silicon dioxide (n-SiO2) and zirconium dioxide (n-ZrO2) nanoparticles have been studied. 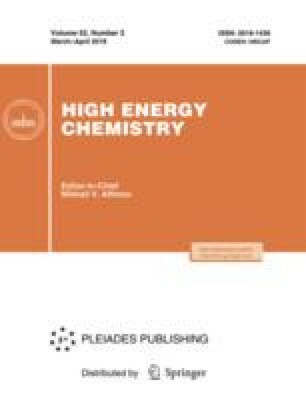 The kinetics of buildup of molecular hydrogen in the radiolytic processes of water decomposition in the test systems has been examined. The reaction rates and the radiation-chemical yield of hydrogen in the radiolysis of water in the presence of n-SiO2–n-ZrO2 mixtures with different ratios between the components have been determined. It has been found that the rates and radiation-chemical yields decreased on going from n-ZrO2 to n-SiO2. The individual components (n-SiO2 and n-ZrO2) and the mixtures of n-SiO2–n-ZrO2 and n-SiO2–n-ZrO2 + H2O before and after γ-irradiation have been examined by Fourier-transform IR spectroscopy in order to reveal interactions between the components and to study the mechanism of radiolytic processes. It has been found that the adsorption of water in the test systems occurs via both molecular and dissociative mechanisms. It has been shown that there is no noticeable interaction between the components of the oxide nanoparticles under the conditions of the experiments. Original Russian Text © T.N. Agaev, A.A. Garibov, S.Z. Melikova, G.T. Imanova, 2018, published in Khimiya Vysokikh Energii, 2018, Vol. 52, No. 2, pp. 129–134.